(Chicago) – TASC and its Center for Health and Justice – @TASC-CHJ on Twitter – will participate in a May 3 twitter chat hosted by the Pretrial Justice Institute to discuss the role of behavioral health in pretrial justice. From 1-2 PM Central time (2-3 PM Eastern), participants will discuss the intersection of pre-arrest diversion and pretrial justice, including how justice partners and behavioral health service providers can collaborate to divert people with substance use and mental health conditions into treatment in the community. The hashtag for the conversation is #RecoveryNotArrest. TASC and its Center for Health and Justice have been working closely with PJI, the Police, Treatment, and Community Collaborative (PTAC Collaborative), and partners across the country to advance pre-arrest diversion as a means to help reduce drug use and overdose deaths, improve public safety, reduce incarceration and its collateral consequences, and improve relations between law enforcement and communities. For example, Illinois Senate Bill 3023 proposes to create the Community-Law Enforcement Partnership for Deflection and Substance Use Disorder Treatment Act, authorizing and encouraging local law enforcement leaders to partner with treatment and community members on programs that “deflect” individuals who have overdosed or who have substance use problems away from the justice system and into addiction treatment services. Championed in the Illinois State Senate by Chief Sponsor Sen. Melinda Bush (D-Grayslake) and Co-Chief Sponsor Sen. Tim Bivins (R-Dixon), and in the State House by Chief Sponsor Rep. Marcus Evans, Jr. (D-Chicago), the bill is a joint initiative of the Dixon Police Department, the Mundelein Police Department, and TASC, and currently has more than 140 proponents, including more than 85 police departments and law enforcement associations across the state. 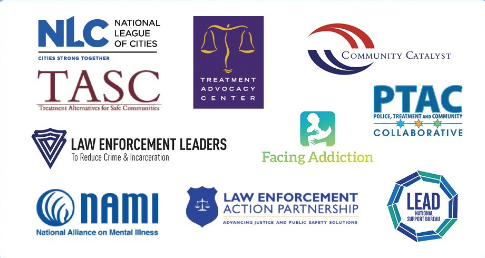 Hosted by the Pretrial Justice Institute, participants in the May 3 #RecoveryNotArrest Twitter chat include the partners above, among many others.